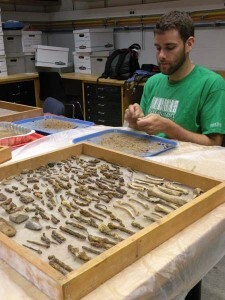 Weblog for the Fiske Center for Archaeological Research at the University of Massachusetts Boston. The most common question that visitors to the site asked was whether we had found anything, and, if so, what? Looking at the boxes in the lab on Friday made it clear that we’ve found a lot. We divide the kinds of things that we find into two major categories: artifacts and features. Artifacts are the things that everyone thinks of – the buttons, piece of pottery, remains of bottles, and so on. Features are things that we can’t pick up and take with up back to the lab but are equally important. Features at Munroe Tavern included the brick and tile drains and conduits that carried water from the well and the former kitchen through the brick trough that we are postulating was a flushing privy of sorts. You can see this system in the overhead photo posted last week. Features also can be less structural; the hole that was dug in order to build the well is itself a feature. (To dig a deep well, like the one at Munroe Tavern, you first dig a much larger hole that gets smaller as it gets further down. As you build up the well itself, you fill back in the large hole around the well.) We excavated a good sample of this feature, and the artifacts in this backfill around the well help to date the well. The artifacts in the backfill around the well are mostly large pieces of redware, the most common 18th and early 19th-century ceramic type. Redware could be heavy and coarse or thinner and more refined and was used to make mugs, chamber pots, storage jars, tea pots, milk pans, colanders, and all sorts of common kitchen items. We have a good collection of these from the well backfill, many in large pieces that can be reconstructed into vessels. The photo above is from two mending pieces of a milk pan. Some pieces are decorated with white slip designs. Redware itself is hard to date because it didn’t change much, but we also found a more diagnostic ceramic in the same feature. There were a few fragments of creamware, a type that wasn’t produced until the 1760s, in the same fill. 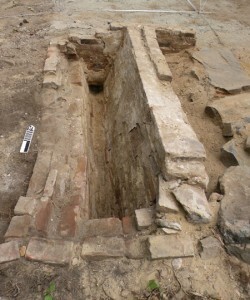 The presence of the creamware tells us that the feature was formed after the 1760s (i.e., the well was dug sometime after that time), but not too long after because other later types were absent. We also found a collection of mid-19th century artifacts, especially glass, from the time the ell was in use. Artifacts from this time period include a few children’s toys: the glass eye from a doll and a miniature tea pot. 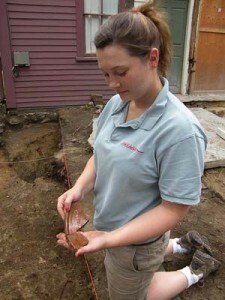 Thursday marked an emotional day for the Archaeologists at Munroe Tavern’s excavation. We all remarked upon the sadness of packing up the site and leaving Lexington for the summer. But one element of our time in town resounded – Yes, the excavations were a success and yes, we all felt lucky to have worked on such an important site – but mostly, we reflected upon the incredible outpouring of support and interest by the Lexington public and all those who came to visit us throughout the month. So before I go on, I’d like to say thank you to all those who visited us, read our blog, read about us in the newspaper, or supported us in any way – You made this a remarkable experience! Everything we collect in the field is first transported back to our labs at the University of Massachusetts Boston (which is actually in Dorchester, but who’s counting?) where it is sorted and preliminarily catalogued and sent to the appropriate lab space. I’ll very briefly introduce you to the journeys of two different types of materials. The first is material culture. Material culture is a term we use to lump together almost all of the artifacts that we collect in the field. This includes sherds of pottery, pieces of brick, metal artifacts such as nails, buttons, coins, and the more delicate pieces like shoe leather and bones. Those artifacts that are strong enough to withstand it are first washed and scrubbed with toothbrushes and then left out to dry, as seen in the photo above. Later each of these individual artifacts is cataloged into a digital inventory where they can be quantified and analyzed in both space and time which helps archaeologists to draw conclusions about human behavior in the past. The more delicate artifacts (such as bone, leather, and some metal artifacts) are carefully conserved and stabilized so that they can better be studied. After each artifact is analyzed, identified, and cataloged they will be given back to the Lexington Historical Society, who may choose to use them for museum displays or as educational tools. Another set of materials we analyze are botanical samples. This is my particular specialty. As a paleoethnobotanist (if you break down that Latin it really just means a person who studies old plants used by people), my job is to process and analyze soil samples collected in the field. This process is a long one, with several steps. First the soil samples are floated. We use a machine called a flote-tech to literally "float" the botanical materials out of the soil collected from the Munroe Tavern ell, which is what I’m doing in this photo. 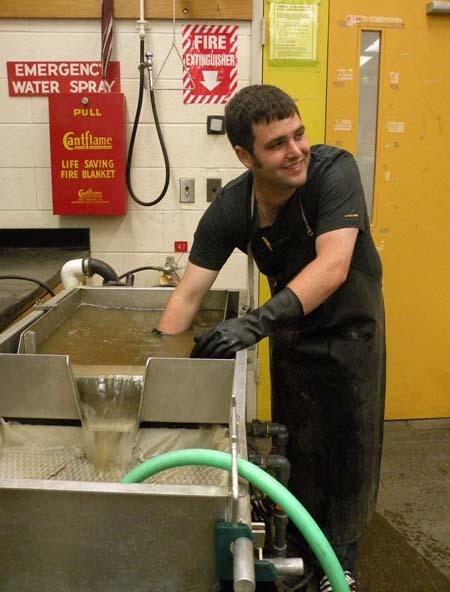 The machine separates out and washes away the soil leaving behind two samples, one of heavy materials (like rocks and ceramics) and another of light materials (such as seeds, charcoal, insect carapaces, and other things that float in water). These two samples are then dried out and individually analyzed under a low-power microscope. Seeds and other botanical materials are removed, identified, and counted and are cataloged just like the other artifacts we find and can be statistically analyzed in much the same way. Along with bones, seeds help archaeologists to recreate the diets and foodways of people in the past. Do you have a favorite recipe learned from your mother or father? Or maybe you like eating at a certain kind of restaurant that represents the cuisine of a country or foreign part of the world? Well, people in the past thought of food in much the same ways that we do now, and because of this we archaeologists consider food to be an important window into understanding cultures of the past. That’s just a sample of the different ways in which what we find in the field translates into work in the lab and eventual publication, museum exhibits, or other analyses of past peoples. Well, guess I better get back to work! To compare to the similar photo from a few weeks ago, here’s an overhead photograph of the final size of the excavation area. The Lexington Minuteman ran a story today about our recent finds including a photograph of one of the shoes and some of the matching buttons. We found five of these buttons with a sunburst design last week and another one today while excavating more of the same deposit. Munroe Tavern: In the Thick of Things! We’ve gotten to the point in the field season when we’re all feeling the pressure of the end of the excavation looming – we only have a week and a half left! We have a lot of excavation units open, and we’ll be trying to finish these off and open just a few more in the remaining days. The features that we are findings are falling into three categories. The biggest and most visible are the features associated with the construction of the ell in the 1860s, including the now very elaborate brick and tile conduit and drainage system and the foundation itself. Associated with these, we have a good collection of mid-19th-century artifacts. These include a few neat remnants of kids’ toys like the glass eye from a doll and a child’s teapot. We also have a growing collection of earlier artifacts from some of the old ground surfaces under the ell and a few features. These features include one post hole, which would have supported the corner of some earlier outbuilding, and the large hole excavated to dig the original well. Both of these have some large fragments of redware in them. Redware is a coarse earthenware that was used to make all kinds of utilitarian vessels in the 18th and early 19th centuries, including milk pans, food storage jars, mugs, and chamber pots. Our other early feature, which we are still trying to understand, is a badly disturbed cobble floor, walkway, or building support. Unfortunately, the cobbles have been disturbed by our third type of finding: more recent utility pipes for water and sewage! Three or four generations of pipes have cut through these cobbles, starting with the tile drain constructed in the 1860s. Because of this, we know that the cobble feature is older than 1860, but it’s hard to tell what it was because we have so little of it left. There have been some really interesting artifacts associated with these early features, some buttons and some leather shoes, but I’ll leave those for another post. The rain chased us out of the field mid-morning today, but we were able to use the early morning cloud cover to get some good overhead shots of the excavation area from the Tavern’s attic window. Here’s one that shows the outline of the ell, the drainage channels and conduits (the well is under the gray slab at the right), and other units in progress. The unit in the lower left illustrates the dramatic color difference between the undisturbed subsoil (bright yellowish-orange) and the dark topsoil that is just above it. 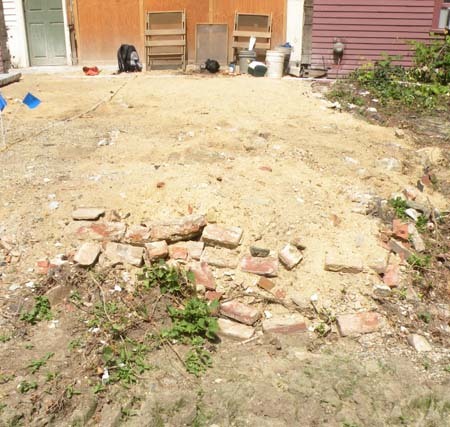 The brick rubble scatter in that unit included a number of bricks marked "NEB Co" for New England Brick Company, which operated from the mid-19th to the mid-20th century. We carefully excavated the unit to expose the bricks to their best advantage and were wary of digging too deep and undercutting the structure. As of now there appear to be at least four or five courses of brick in this section of the drain, and you can see from the photo that there is a definite slope downwards from one end to the other. Perhaps this reflects the slope of the ground at the time, or maybe this angle would have allowed for faster flow of water. Once we determined how far down the bricks went, we took a two liter sample of soil from inside the structure. This soil sample will be taken back to our labs at UMass Boston and run through a Flote-Tech Machine, a machine that pumps a whole lot of water into the soil allowing the seeds and other plant materials to literally float to the surface. 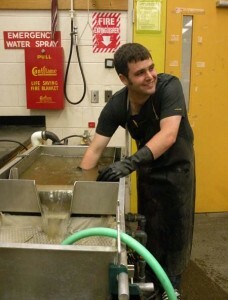 It’s a fun process that involves getting your hands dirty and wet, what more could an archaeologist want? We can then collect these plant materials and analyze them under a microscope. We’re hoping that samples like these will give us a better idea of the environmental conditions that surrounded Munroe Tavern in previous times. We also took a brick sample (an entire brick that had fallen into the drain) and a mortar sample in order to understand the building methods and materials that went into this structure. As you can see, the two appear to be part of the same structure. In fact, when taking the soil sample (a delicate process), I could actually look through one end of the brick drain into its counterpart! Our current thinking is that we have is a brick drain that probably dates to around the construction of the ell in the mid 19th century. But where did the water come from and where did it go to? We don’t have the answer to the second question yet, but we believe we have the answer to the first. This appears to be a brick and tile drain that took water directly from the old well and fed it into our brick structyre nearby. It’s a pretty impressive water system and it looks like it ran over a large area. As I said before, we don’t as yet know where all of this water was flowing to. Was it the water system for the new kitchen? Did it serve the old buttery that lies somewhere nearby? Or was it early flushing plumbing for an indoor sanitary system? If you have an idea what this drain system might have been used for, please feel free to drop us a line in the comments below. If you’ve got one just like it in your back yard, even better! We encourage all who are interested to stop by and check out our excavation, we’d love to share what we do with you and answer any questions you may have. The Fourth of July holiday weekend is upon us, and at Munroe Tavern there is another good reasons to celebrate: Our Fiske Center Archaeology Team has completed all of the preliminary work necessary to begin full-scale excavations next week! This preliminary work included removing a layer of sand fill from the area underneath the ell; identifying, photographing, and mapping foundation stones and a brick feature; and targeting areas for further excavation. Check out the before and after pictures! Why is there sand, you may ask, underneath the ell? The sand was placed over whatever existing structural remnants were present when a concrete pad (which served as the floor) was placed there (probably during the 1960s). A remnant of this concrete pad can be seen in the picture below, where it is currently being used to cover a well. The sand has a leveling effect which forms a nice, flat surface to pour the concrete on. Luckily, both the concrete and the sand protect and preserve what’s below them. Upon removing the sand (which, though easy to scoop is quite heavy! ), we were able to identify, photograph, and map foundation stones that may be from the original construction of the ell in the 1860s. We also uncovered a brick structure that we have not been able to successfully identify yet. Take a look at the image below and see if you can identify this feature. If you have an idea, drop us a line via the comment box below. Our guesses so far include a trough and a drain of some sort. Note that along the bottom on both sides are openings. We’re hoping to clarify its function archaeologically by excavating an adjacent area, and we’ll be sure to post when we have figured it out. The first photo is what the area looked like when we started; the second is what was underneath! 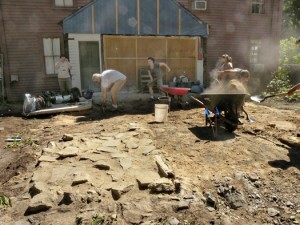 Targeting areas for further excavation is a necessary part of many excavations. Though we would love to be able to open up the entire area, time constraints make it necessary to pinpoint specific locations that may be particularly informative. We combine historical documentation, features or artifacts visible in the ground, soil changes, and at times sheer intuition to determine areas of high archaeological significance. Shovels, trowels, buckets, and artifact screens are the tools of our trade: they allow us to essentially “ground-truth” our lines of evidence and ensure that the features and artifacts in these areas are recorded and recovered. This is the adventure that we will embark upon next week when we begin our full-scale excavation of several units in the area where the ell used to stand. We have had several visitors so far, and we would like to encourage anyone who is in the area or will be in the area in the month of July to stop by and check out Monroe Tavern. It is definitely worth taking one of the daily hourly tours (running from 12-4PM), plus, you get the added bonuses of witnessing an archaeological excavation and asking the archaeologists questions. We’re there Monday to Friday, 8 to 4 in good weather. We truly enjoy the opportunity to interact with people and share our work with you, so don’t be shy! For those who are curious, the most common question we’re asked is if we’ve found anything yet, and rest assured that we have. However, most of what we find would largely be considered garbage to most people. We have recovered copious amounts of construction materials, including nails, wood, plaster, glass, and bricks, a couple of bottles, some relatively modern ceramics, and a glass doll’s eye. Even though they are not old, relatively speaking, we can interpret these artifacts to better understand the Tavern’s role through time and even some of the people who were an active part of its long and rich history. The Fiske Center’s upcoming excavation isn’t the first archaeological project to take place at the Tavern. In 1984, Roland Robbins conducted an excavation to locate the foundations of the Masonic Hall. While he did not identify these, he did collect documentary evidence related to the use of the hall and located two cellars under the hall’s assumed footprint: one was the cellar for a shop that was located on the first floor of the hall and the other he argued was a 17th-century structure. He also located a well and a cobble pathway. He collected some artifacts, and we’ll examine those as part of this project. 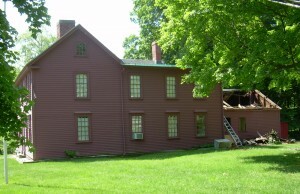 The Munroe Tavern was one of Robbins’ last projects; two decades earlier he had excavated at the Hancock-Clarke House, another one of the Lexington Historical Society’s properties. Robbins’ techniques were rather different from those that we use today. Robbins was mostly interested in identifying building foundations, so he excavated quickly. Today, we want to recover as many types of information as possible, so we record information about the soil layers, collect all types of artifacts, and take soil sample to recover seeds and other tiny remains. All of this means that work proceeds slowly and carefully. The most important information we collect is the association between artifacts and the types of deposit they are in; this is called context. Archaeological context includes a description of the soil, of the types of soil in the layers above and below, the precise location, and information on other of artifacts deposited at the same time. If you’d like more information on Roland Robbins, you can read Donald Linebaugh’s biography of Robbins, The Man Who Found Thoreau (University of New Hampshire Press, 2004). Anyone passing through Lexington on May 25th and 26th might have noticed some demolition going on at the historic Munroe Tavern. The rear ell, the newest addition to the building, was removed as part of the Lexington Historical Society’s plans to restore the structure. Their plans include building a replacement ell that will house new curatorial, office, and educational space as well as climate control systems to protect the rest of the house. 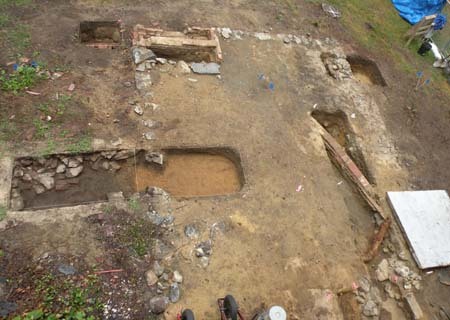 Before the new ell is built, the Fiske Center for Archaeological Research at UMass Boston will conduct archaeological excavations in the ell footprint to look for deposits and outbuildings that were behind the main building. 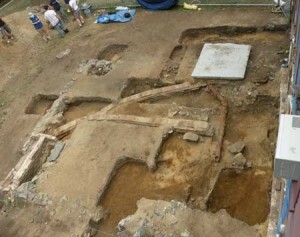 The excavation will take place during July 2010, and the public is invited to visit the site and talk to the archaeologists. We’ll also post updates with our progress here. The core of the Munroe Tavern was constructed ca. 1735 with a series of 18th and 19th century alterations and additions that resulted in the building’s current layout. The most recent addition was the building’s rear ell which was added sometime in the 1860s and has been subject to substantial 20th-century alterations. There is a documentary reference to an even older house on the property in a 1697 deed, but the location of this older house is unknown. As its name suggests, the building was a tavern and inn, at first intermittently, then steadily. It was also a residence, farm, store, and site of a Masonic Hall (added in 1798). The Munroe family, whose name the structure now bears, ran the tavern from at least 1769 and purchased it in 1770. During the Battle of Lexington and Concord in April of 1775, the site was briefly occupied by the English troops who used it as a field hospital. The tavern closed in the 1850s, and the Masonic Hall was torn down at the same time. The building became a private residence until it was acquired by the Lexington Historical Society in 1911. As a shop, inn, tavern, hall, and house museum, the site has had a long history of public use. By excavating under the ell, which was added when the building was converted from a public tavern to a private residence, we hope to find evidence of the tavern period and Lexington community life in the early 19th century and before. For more information on the Lexington Historical Society and the Munroe Tavern, visit the LHS’s website.